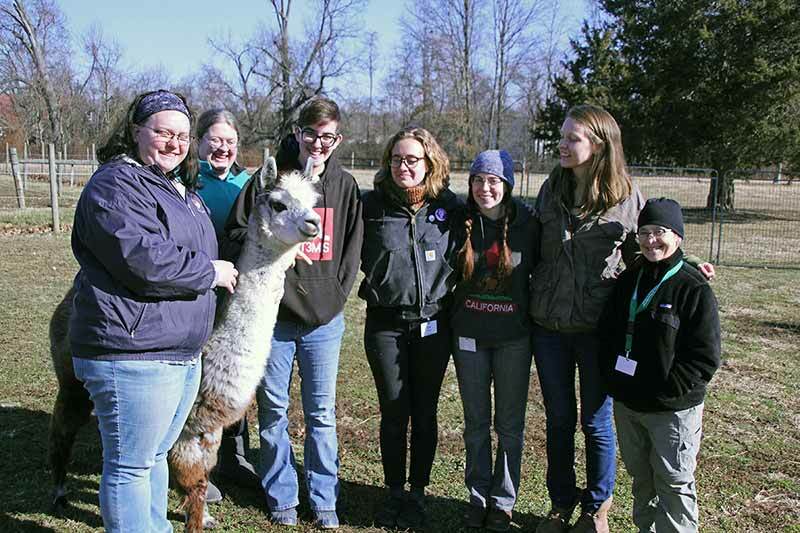 2017-2018 White Violet Center for Eco-Justice interns with Georgie, one of the alpaca. 1. Jumping out of bed and into the field! Interns live in a small house surrounded by vegetable gardens, alpacas and horses. Whether you’re surrounded by people with similar points of view or different, there are a ton of opportunities to learn and share. The hands-on experiences gained at the small farm at Saint Mary-of-the-Woods, Indiana, can help with that dream of starting a Community Supported Agriculture program in another country or having your own flock of chickens someday. Former intern Molli Meyers planting peas. Interests in organic agriculture, fiber arts and caring for alpacas are strengthened through daily education and work. You can build confidence and knowledge in immersing yourself in this ministry. Growing your own food takes skill. 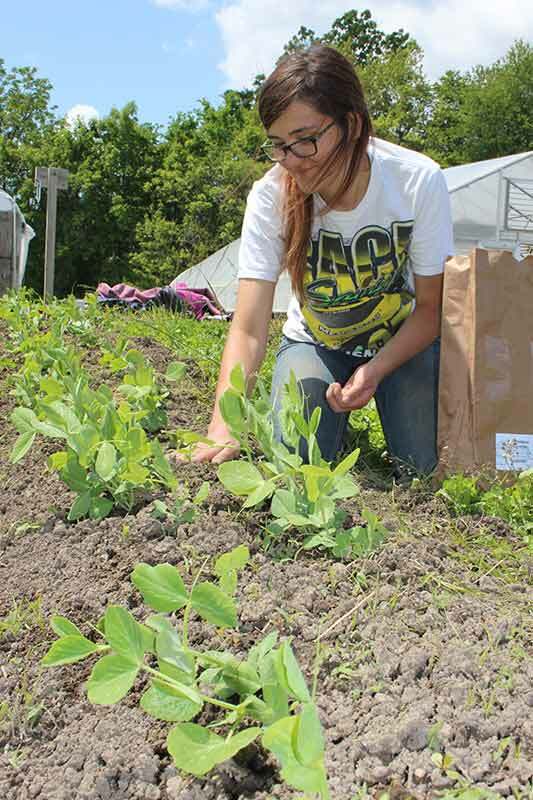 Planting and harvesting vegetables for a Community Supported Agriculture (CSA) program, and to be sold wholesale and to the local farmers’ market provides the safest and freshest food for families. Working in the USDA certified organic gardens, caring for the alpacas, and collecting eggs from the chickens are dirty (and rewarding) jobs. You’ll make memories for a lifetime. It’s hard work, but it’s a lot of fun, too. Depending on the time of year and length of internship, there might be topical presentations from staff and guests, White Violet Center workshops and retreats, field trips, conferences and workshop opportunities off-site, as they arise. Oh! And you don’t have to be a student to live, work and learn with us. Check out Internships.WhiteViolet.org to learn more and apply today! Cheryl, pointing out these seven experiences to potential interns should attract future interns. Keep up your great advertising of possibilities in the intern program. My daughter, Crystal, just finished her internship – what a wonderful life changing experience is was for her! I am enjoying all the stories she is sharing from collecting eggs, to lunch with everyone, to her beautiful fiber projects. She wakes up thinking she has overslept because she needs to care for the alpacas! I don’t know where her next steps will take her, but I do know that her time at White Violet Center will be one of those treasured jewels she will carry the rest of her life. I would highly encourage anyone thinking about an internship to do it! There is so much potential and new opportunities that can’t be put into words or pictures. You will never look at your food, and indeed the whole world, in the same way again. We miss Crystal already, Linda! Thank you for such kind and encouraging words!